After she finished her second helping (thank you very much!) I asked her if she’d ever had spinach before. She said she’d never tried it (by choice, of course!) and as it turns out she’d never tried lettuce or any leafy greens before. So I informed her that spinach was the secret ingredient in the smoothie I just gave her …and so now she can say she’s tried it and likes it! She continued to have a rather surprised look on her face LOL. I’m only okay with “hiding” secret ingredients as long as you tell your picky eaters about it afterward so they know that particular vegetable (or whatever it is they supposedly don’t like) isn’t so bad after all! I hope this trick works on your little ones as well. Blend ingredients together until smooth. Serve cold. 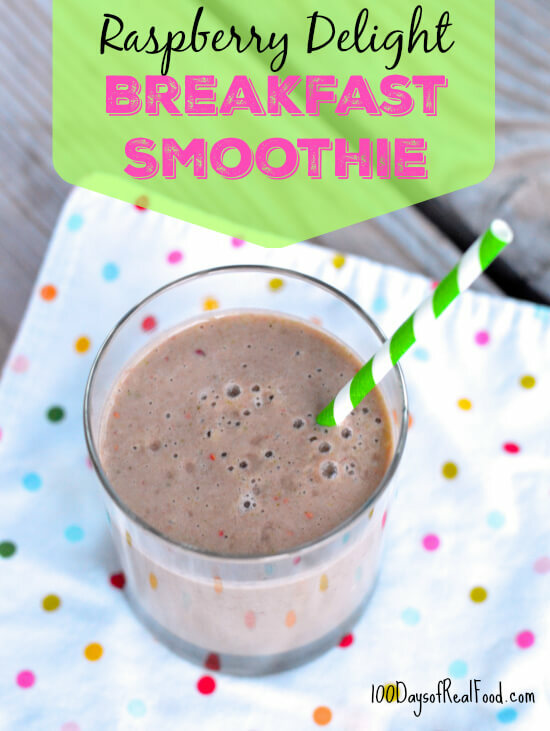 My Favorite Green Smoothie + Other On-the-go Breakfast Ideas! Lisa is a wife, mother, foodie, blogger, and New York Times Best-selling author who is on a mission to cut out processed food. 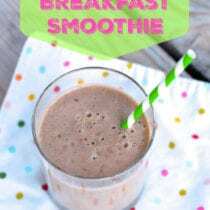 My kids gulp down this breakfast smoothie packed with fruits and veggies + protein in the yogurt and honey for a little energy boost. 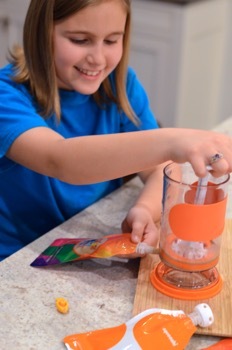 I make the same thing minus the chia seeds and freeze for summer popsicles! To be honest, I don’t measure so much as just fill up the bullet blender. :) My kids love the idea of “eating the rainbow” so we do red-raspberries, orange-carrot juice, yellow-honey, green-spinach/kale, blue-blueberries, purple-blackberries! Great idea! I love the thought of putting spinach into smoothies for your kiddos. We do it all the time too! I’ve even put spinach in our pancake recipe…https://focusedonfit.com/recipe/simply-perfect-spinach-pancakes/. Always looking for more ideas for our picky eater! Bravo! Enjoyed your story. Love this nutritious and simple recipe. When my children were small I would hide (puree) vegetables in many of our meals. Right or wrong, I chose to not tell them back then because I thought they would refuse to eat that dish again. My son is now 24 years old and my daughter is 22 years old. When I told them they were thankful that I did this although surprised. I just throw in whatever quantity I want, and if there’s any left over I make smoothie pops. IKEA has great molds that are inexpensive. My husband was forever trying to get the kids to try a green smoothie but they would always make a face after the tiniest sip and declare it gross. So I bought purple kale and blended it with blueberries and blackberries, bananas and some orange juice. I let them know there was a secret ingredient. They drank huge glasses of it while they tried to figure out what the secret ingredient was and talked about how delicious it was. After I told them that it was kale, they were surprised but in a good way. Now we blend all sorts of green leafy veggies into smoothies and they love it. I always freeze the leftovers into popsicles they love as a treat. Funny story- One day I made a smoothie with a bunch of spinach and a lot of chard. My husband and I thought it was too strong veggie tasting for us but we drank ours without a word. The kids asked for seconds. The next day I made the same smoothie with about half the chard and all three kids wouldn’t drink much and said that the smoothie from the day before was much better. Fill blender with leafy veggies and add enough liquid to blend it. Then I add a couple bananas and fill it to the top with any other fruit and blend it again. Easy! I love that you kept trying the green smoothies! It’s easy to give up after a couple attempts when kiddos turn their nose up at whatever it is we’re trying to get them to eat. Aaaaahhhh, this post makes me want to buy all the fruits and leafy greens! If I’m not careful I’ll have more smoothie than I know what to do with. Gotta pace myself. I adore that you continued attempting the green smoothies! It’s anything but difficult to surrender after two or three endeavors when kiddos turn their nose up at whatever it is we’re attempting to motivate them to eat. I just get new one here. Combine all ingredients in a blender and process until smooth.